The body of this laser tag gun is the real deactivated gun made by “Izhevsk Machine-Building Plant”. This means that this new game set is almost completely made of gun steel (except the plastic forearm, magazine and pistol grip). 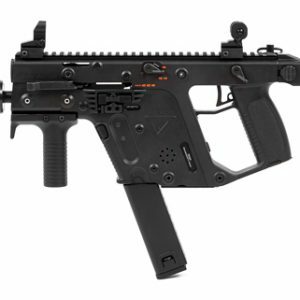 The structure real deactivated gun determined its electronic features and their allocation: the body just has no room for high capacity batteries, so we use a lithium battery with 2200 mAh capacity as the tagger power source, which provides up to 30 hours of operation. For the same reason, we had to use «Mini» series speaker, but in the end, thanks to the acoustic properties, this gun sounds enough quality and loud. – standard Russian guns side fastener for KV-80 bracket, located on the left side of the breech frame. 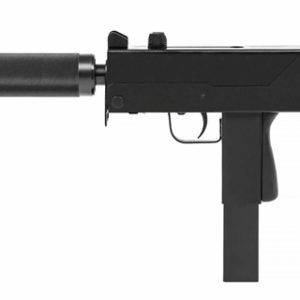 It should be noted that when using the side bracket, the stock of the gun cannot be fixed in the folded state. As in the other game sets based on real deactivated guns, switching on of PP-19-01 “Vityaz” is made by gun safety lock and reloading is made by the bolt. The basis of the optical system is PBS-1 polyamide tube, which provides an optimal fire range of 300-650 feet (100 – 200 meters). Due to high reliability and excellent performance, we recommend PP-09-01 “Vityaz” for rental, but due to the low power supply capacity, we recommend using it as an additional gun for a sniper or machine gunner.